Opened in 1964 and run by Gaby Elyahou, this cosy establishment, plastered with theatre posters old and new, is the epitome of comfort food for its many regulars. Reasonably priced and generous portions of Middle Eastern and European cuisine satisfy lunchtimes and pre-theatre meals such as the Salt Beef Special, melt-in-the-mouth salt beef sandwiches accompanied by pickles and a selection of salads, or a hearty shishlik with a large serving of chips or rice. 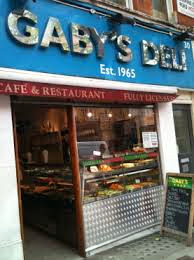 Along with salt beef, Gaby’s Deli is also renowned for its falafel which Elyahou claims he introduced to London! Gaby’s is ideal for vegetarians and the health conscious with, apart from falafel, its wide choice of hot and cold salads (you can order a plate of up to seven different types of your choice) and filling dishes such as stuffed peppers and vegetable moussaka (which was approved by a veggie friend on a recent visit!). Desserts include the winter friendly apple strudel and eastern classic baklava. Recently, Gaby’s Deli became the face of the battle that independent restaurants and shops face against ever-growing high street chains. Gaby’s faced closure last year as its landlord Robert Gascoyne-Cecil, the 7th Marquess of Salisbury, had plans to transform the site to accommodate a chain restaurant. Fierce opposition to the plans ensued with a petition doing the rounds and big names from the worlds of art and entertainment, including Simon Callow who staged a show in the middle of Gaby’s to raise awareness of the situation, voicing their objection to the proposals. So far, Gaby’s Deli has won and redevelopment plans are currently on hold. Independent establishments in London are becoming scarce, with the capital’s streets becoming increasingly identikit as yet more Prets and Starbucks open. I admit that I do enjoy a Pret sandwich from time to time but a chain lacks the unique character and a certain kind of warmth that an independent can offer. I can while away the hours at a place like Gaby’s whereas at a chain cafe I just eat quickly and leave. Also, keeping independents open is crucial in maintaining London’s sense of incredible cultural diversity - take that away and London will be like any other city not to mention depressingly beige. So next time you’re feeling peckish in the West End, order a salt beef sandwich with lashings of mustard and a pickle at Gaby’s Deli - a one-off gem in the heart of Theatreland that feeds the soul as well as the belly!